Grace College Professor of Accounting Dr. Roger Stichter helps prepare students for the CPA exam. Grace College was recently recognized as Indiana’s best private school for accounting by AccountingEdu.org. AccountingEdu.org has recognized Grace College as the most effective and efficient accounting program among all private colleges and universities in Indiana. The organization – which analyzes cost per credit hour with Uniform Certified Public Accountant (CPA) Examination pass rates – selected Grace as the best private school option in the state due to its affordability and graduates’ exam success. Not only did Grace outpace all other Indiana schools, but its CPA exam pass rate was the third-highest among all colleges and universities nationwide on AccountingEdu.org. In 2017, more than 70 percent of Grace College graduates passed the CPA exam on their first try. Grace’s cost per credit hour is $826. “We’re honored to receive this recognition from AccountingEdu,” said Dr. Roger Stichter, Grace College professor of accounting. “Our accounting program easily allows students to graduate in four years with the needed 150 credit hours to sit for the CPA exam, and their results are promising. Our graduates’ high pass rates are an encouragement to prospective students and families looking for affordable, quality education,” he said. Grace College offers a BA and BS in accounting at its growing campus, located in the historic lakeside town of Winona Lake, just east of Warsaw, Ind. Students choose among a BA program, which includes a foreign language concentration, or a BS program with a focus on math and science. 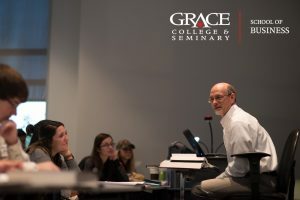 Many Grace students opt for the accelerated three-year bachelor degree program and the blended degree program which allows students to earn their bachelor’s and master’s degree in just four years. For more information on Grace’s AccountingEdu.org distinction, visit accountingedu.org/bachelors-list-most-affordable-schools.html. For more information on accounting and other academic programs in the Grace College School of Business, visit grace.edu/schoolofbusiness.